If you’ve never had Mexican hot chocolate before, you’re in for a treat! 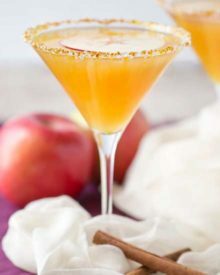 This less overly sweet version is spiced with warm cinnamon and a pinch of cayenne pepper, and is perfect for a cold night! This is the time of year when things get crazy. Between school homework, extra curricular activities, school fundraisers, and holiday prep… I think we all need a break and big mug full of hot chocolate! 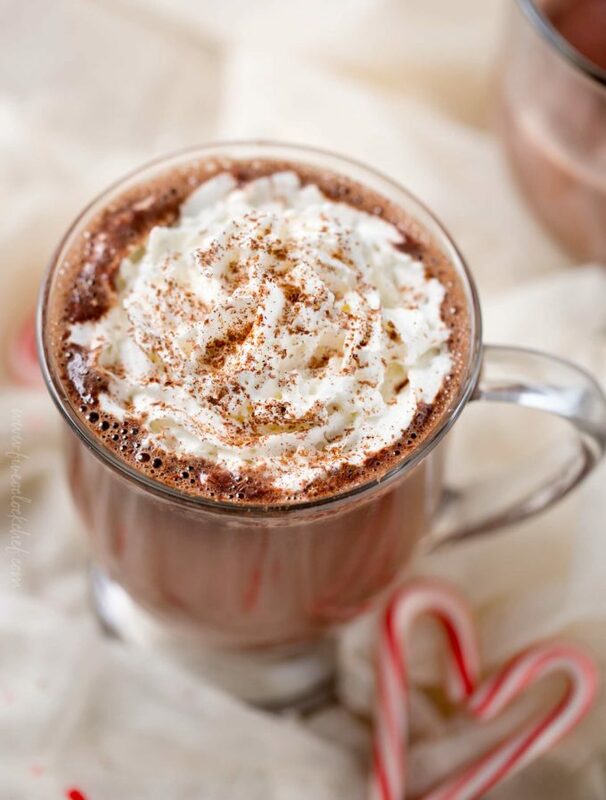 But not just any hot chocolate… THIS Mexican hot chocolate. It’s rich. It’s creamy. It’s unlike any other regular hot chocolate. And it’s just begging to be spiked with a shot of tequila! Have you ever had a Mexican hot chocolate? 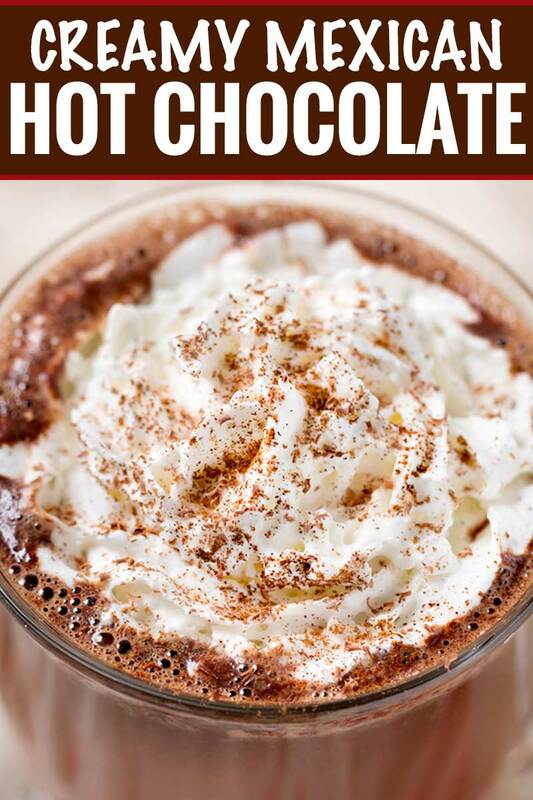 It’s different from “regular” hot chocolate in that it has a more pronounced chocolate taste, is less sweet, and has unique spices like cinnamon and either chili powder or cayenne pepper to give it a slight kick. Don’t worry, you’re not going to have to down a glass of water after taking a drink… the spice is more the type that deliciously lingers on your tongue after you’ve had a sip or two. CAN THIS MEXICAN HOT CHOCOLATE BE MADE IN THE SLOW COOKER? Yes! 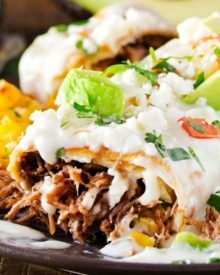 There are a couple of tips for altering the recipe for a slow cooker, so be sure to check them out. Mix the cocoa powder with 1/4 cup hot water until it’s completely smooth and dissolved. Add all the remaining ingredients to the slow cooker (I love this small 3 quart version), and cook on LOW for 2 hours, stirring every 30 minutes or so. What kind of toppings do you usually like on your hot chocolate? 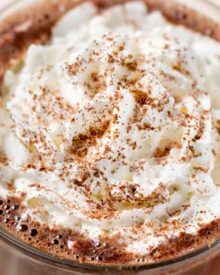 Normally I’m a mini marshmallows kind of gal, but for this ultra creamy version, I like to go with a whipped cream, grated chocolate and cinnamon combination. It’s heavenly! Or you can go for the purist’s version, and skip the topping… either way, it’s delicious! Use quality chocolate, and don’t be tempted to use milk chocolate instead of the bittersweet variety. Milk chocolate is too sweet and will throw off the flavor we’re going for. Don’t forget the toppings… they’re such a fun way to dress up your hot chocolate. If you like your hot chocolate with more spice, feel free to add more cayenne… but go easy, it’s potent stuff! As the weather cools down, there’s one drink I crave regularly, and that’s hot chocolate. 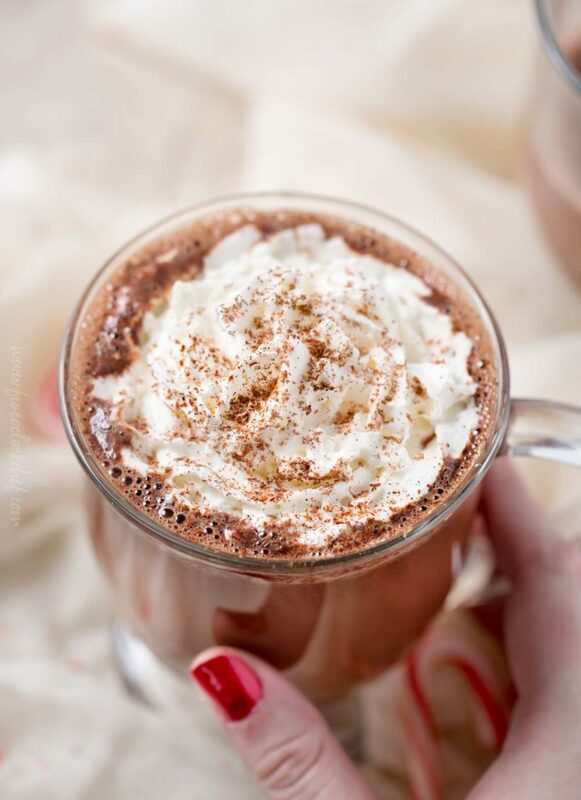 My latest obsession is this Mexican hot chocolate… and I hope you give it a try soon! Glass mugs – I love how versatile these are, and it’s fun to be able to see your drink through them. 3 qt Slow Cooker (if you choose that route) – This size is perfect for drinks and slow cooker dips! 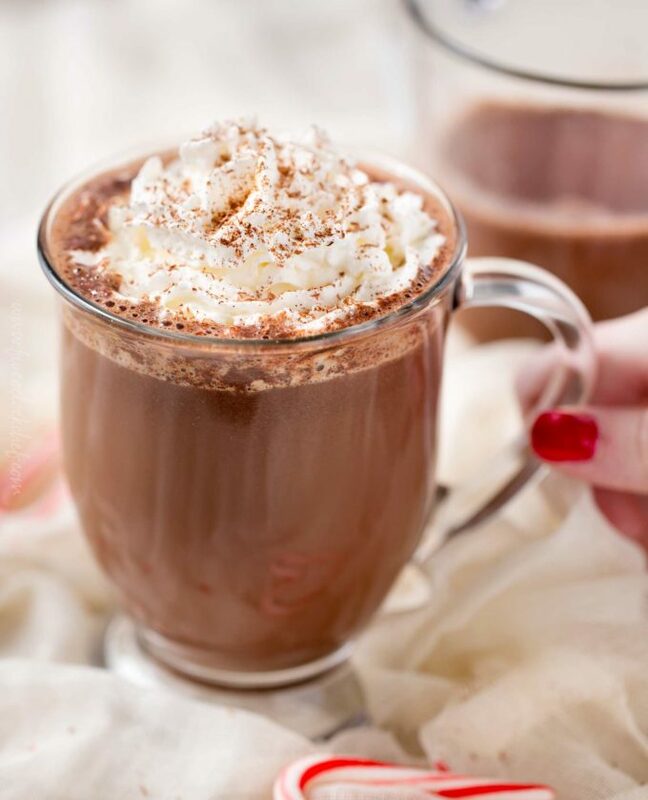 Creamy and rich, this Mexican hot chocolate is made with a pinch of cayenne pepper for some kick! To a large saucepan, dutch oven or stockpot, add all ingredients and heat over MED heat. Whisk as it heats, to combine all ingredients until smooth. Bring to a low boil, then reduce heat and simmer for 3-5 minutes. Pour into mugs and top with desired toppings. My usual preference is whipped cream, grated chocolate, and a sprinkle of cinnamon. Recipe makes approximately 4 1/2 - 5 cups of hot chocolate. Note: This is not an "authentic Mexican Hot Chocolate" recipe. It's my adaptation that my family loves. 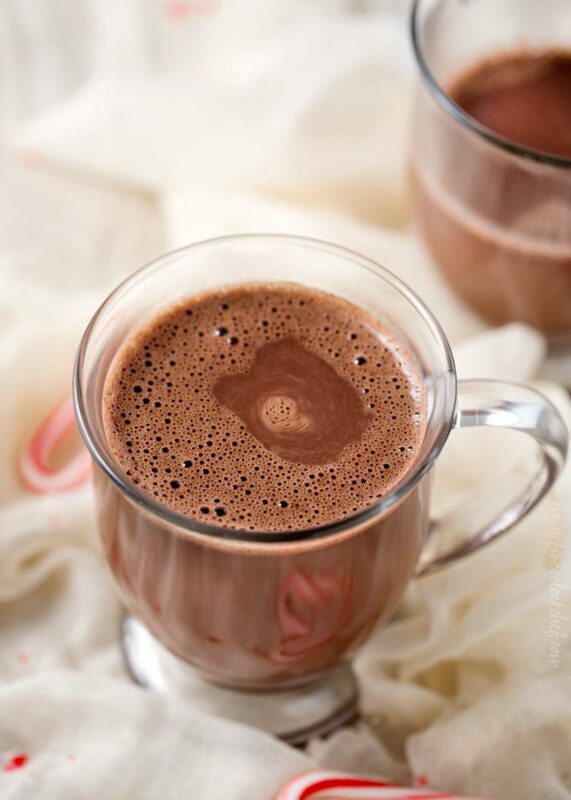 Add a shot of tequila (or your favorite liquor) to a mug full of hot chocolate and stir to combine. Craving for this! Perfect for fall season! I wish I was sipping on this hot chocolate right now! Looks amazing! Looks so rich and delicious! Perfect warm treat on a cold night! I cannot wait for it to cool down here! Live Mecicsn Hit Chocolate!! I’m so looking forward to hot chocolate season! This sounds sooo good, I need a big cup of it right now! This hot chocolate will be happening as soon as the weather cools down. YUM!